For the longest time I have believed that “Cursed” the werewolf movie starring Christina Ricci and Joshua Jackson was the worst movie I have ever seen. Prior to that, the champ was “The Blue Lagoon “starring Brooke Shields and Christopher Atkins. Well, not that I was looking for it but I’ve found one worse than the both of them. All hail the new champion: ALTITUDE. Five friends board a light aircraft, looking forward to a weekend of partying. The pilot is Sara (Jessica Lowndes) who has recently got her license. Within five minutes we know that she’s The Level Headed One. Her boyfriend Bruce should have a sign on him that reads The Character With The Big Secret That Explains Everything since he’s so twitchy right from the first minute we see him that there’s no surprise later on when he does turn out to have The Big Secret That Explains Everything. Mel (Julianna Guill) is an aspiring filmmaker who has the annoying habit of sticking her camera in everybody’s face. Since Sara has claimed The Level Headed One title, this means that Mel is designated The One Who Comes Unglued When Things Go Wrong by default. Sal (Jake Weary) is The Obligatory Dickhead while Cory (Ryan Donowho) is The Rock Steady Heroic Type. Due to a freak accident, the plane flies into a storm, climbing higher and higher because the elevator mechanism that controls altitude is jammed. What’s even worse is that Sara stupidly took off with the gas tank half full and the plane will run out of fuel in an hour. First thing Sara suggests is that they throw everything out of the plane to lighten it and thus make the gas last longer and the second thing she suggests is that somebody climb out on the outside of the plane while they’re flying at top speed through a storm at twenty-four thousand feet to manually unjam the elevator mechanism. I did tell you that Sara was The Level Headed One, right? Right. On we go. It’s Cory who goes outside as he argues that his free rock climbing experience makes him the logical choice. Beats the hell out of me how weekend rock climbing qualifies him to even attempt such a thing but hey, I didn’t write this brain dead mess. The expected happens and Cory is lost. But not before the others see what looks to be a huge, tentacled monster in the storm, following them. Now here’s my beef with ALTITUDE: I dig the idea of a Lovecraftian monster living in the storm and terrorizing the plane. But I also dig the idea of these four remaining people trapped in the plane turning on each other, becoming more paranoid and freaked out. 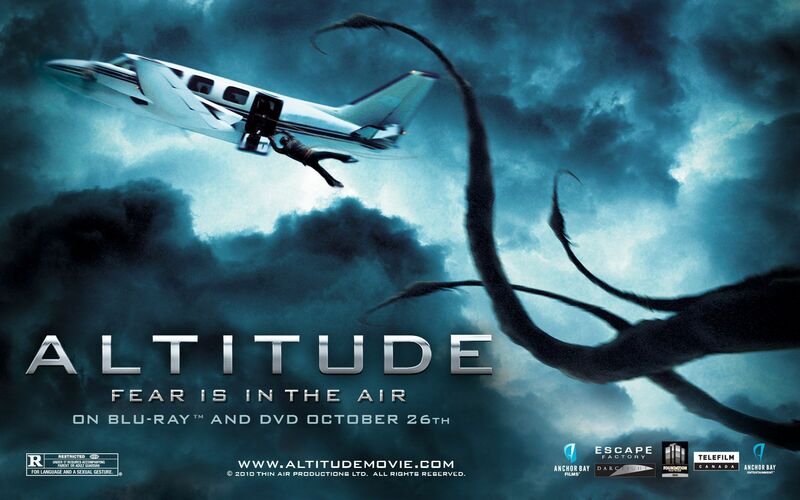 The problem with ALTITUDE is that it can’t make up its mind which movie it wants to be. So it tries to be both and as a result, ends up being neither as it resorts to a final “surprise ending” to explain everything that even M. Night Shyamalan wouldn’t have dared try pulling off. What can I say good about the movie? I did actually like how inventive the cinematographer was in filming the actors inside such a confined space as 90% of ALTITUDE takes place inside a small passenger plane. Even though there’s not much space to work with, I never felt as if I were looking at the same shot over and over again. I did like Jessica Lowndes and admired her ability to sell her character and quite frankly, she’s the reason I hung in there with the movie until the end. An ending that quite honestly left me sitting there with my mouth open as I could not believe what happened in the last fifteen minutes of the movie. If you’re at all curious to see ALTITUDE, it’s on you. Don’t say I didn’t warn you. For me, the worst movie ever title goes to Raising Cain. It’s just about the only time I sat in a theater in open rebellion of the film I was watching and just about the only time I seriously considered getting up and walking out. I’ll catch RAISING CAIN on TV from time to time and I watch it simply because it’s so batshit insane it’s downright surreal. The worst movie both Brian DePalma and John Lithgow have ever been involved with.